The first time I saw Paris was standing in the middle of the Pont des Arts where I could just see the top of the Eiffel Tower. I had dreamt of traveling to Paris for so long that I could hardly believe my eyes. If I was looking at the Eiffel Tower, I must really be in Paris. For some reason, it brought tears to my eyes which is something I rarely experience unless I’m watching some sappy chick flick. But this was no movie. It was the real thing! So, for me, a return trip to the “City of Light” would not be complete without a visit to the Eiffel Tower. Paris was originally nicknamed the “City of Light” because it was a vast center of education and ideas during the Age of Enlightenment. In 1828, Paris began lighting the Champs-Elysées with gas lamps. 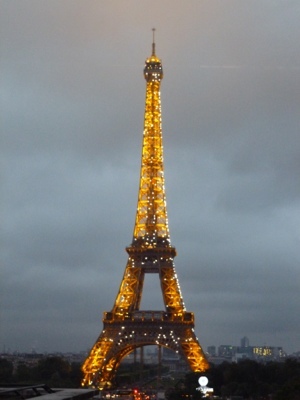 It was the first city in Europe to do so, and so earned the nickname “La Ville-Lumière” or The City of Light. 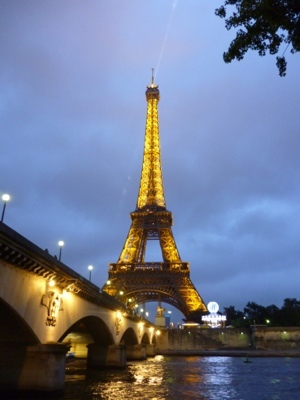 The Eiffel Tower was designed and built by Gustave Eiffel as an entrance to the 1889 World’s Fair to celebrate the 100th anniversary of the French Revolution. At a height of 1,050 feet, it held the title of world’s tallest building until 1930 when it was surpassed by the Chrysler Building. In 1957, the Eiffel Tower reclaimed its title with the addition of its antenna. While it has been the object of much criticism, it has become the most iconic symbol of Paris and the whole of France for that matter. Lighting of the tower began in 1985 with several projectors illuminating it from the inside. To celebrate the millennium, a beacon and sparkling lights were added. This spectacle of light can be seen at dark every evening on the hour for 5 minutes until 1AM. The best viewpoint is from the terrace of the Place du Trocadéro. Installing the lights was no easy feat. It was accomplished over a period of 5 months with the aide of 25 mountain climbers who attached 20,000 special light bulbs one at a time. Late one evening, we made our way to Trocadéro to view this iconic landmark in all its glory. We had previously traveled to the top so we did not feel the need to do this again especially since the tower is currently functioning with only one lift instead of two. It doesn’t get dark until very late so we had a bit of a wait on a breezy, cool night threatening to rain, but the Iron Lady did not disappoint. At 10PM we watched the 20,000 twinkling lights come on and sparkle like a fine diamond. Drawn by her charm, we overstayed our welcome and got caught in the impending rain. Our hasty retreat to the nearest Metro led to an unfortunate fall on a slippery, wet metal plate covering utilities beneath the sidewalk. Fortunately, I was wearing black and only my elbow was worse for the wear. I had paid my price for the visit, but it was well worth it.